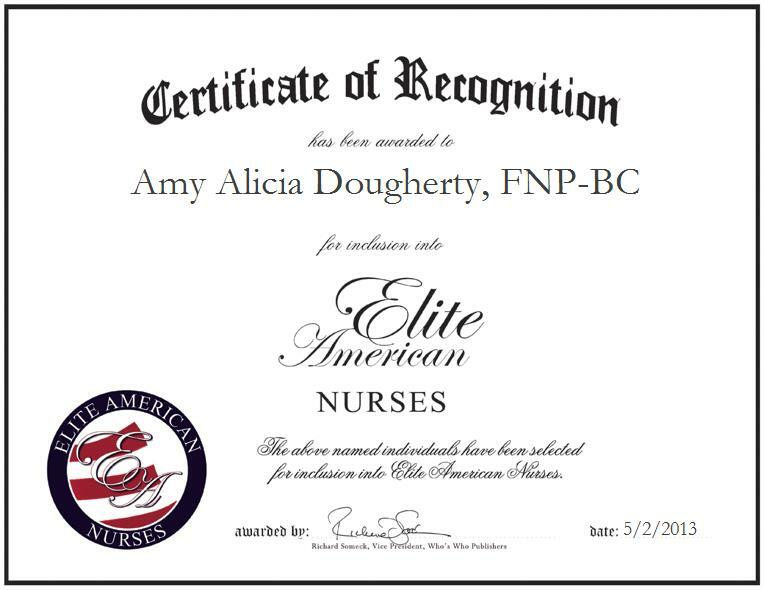 PHILADELPHIA, PA, May 2, 2013, Amy Alicia Dougherty, FNP-BC, Nurse Practitioner for Thomas Jefferson University Hospitals, has been recognized by Elite American Nurses for dedication, achievements, and leadership in nursing. Ms. Dougherty shines as a luminary in her field, bringing forth a wealth of knowledge and experience to her current role at Thomas Jefferson University Hospitals, a leading health care service provider. In her capacity, Ms. Dougherty is in charge of prescribing drugs, meeting with and diagnosing patients, and handling nursing initiatives. She has made a name for herself as an expert in urgent and primary care, and in acute and chronic diseases. Ms. Dougherty was inspired to pursue a career in nursing by a desire to make the most of the knowledge and experience she had come to nurture over the years after having worked in marketing and advertising. She felt that something was missing and was drawn to the medical field, as she felt that the nursing industry would better suit her, as she is a compassionate and obliging individual who is always ready to lend a hand. Ms. Dougherty earned a Certification from the American Nursing Credential Center, and a Master of Science in Nursing. She also received High Honor Distinction from Delta Sigma Theta Tau. Ever passionate about her work, and about helping others, Ms. Dougherty supports a number of worthy causes, including The ALS Association. She feels that she has been able to thrive professionally due to her tenacity, her drive and her determination. She takes pleasure in horseback riding, dancing, painting and spending time with her family and friends in her spare time. In looking forward to a bright future, Ms. Dougherty looks forward to opening her own practice.